We celebrated Todd's birthday this past Tuesday. He doesn't get into celebrating his birthday the same way I like to celebrate mine. I plan my birthday celebration a couple weeks before my actual birthday and Todd is the opposite....no planning...zip, zilch, nada. We had burgers for dinner (a bacon blue cheese for the birthday boy) and then continued the celebration at the golf course. Preston made me hit a few shots just so he could get a good laugh and Noah is certain that he only needs his 5 and 7 iron to play the game. Stella was driving the cart with me riding shotgun and Todd riding on the back of the cart. She took a really sharp turn that nearly tipped the cart on its side and left Stella swinging out the side of the cart hanging onto the steering wheel for dear life. After we stopped and the cart was still in an upright position, I started laughing and couldn't stop. I just kept seeing Stella in my mind swinging outside of the cart. Poor Stella on the other hand was in tears. We finished the night off brownie ice cream sandwiches, a lovely rendition of Happy Birthday, and an episode of Last Man Standing. Happy Birthday Toddy boy! We love you!! Preheat oven to 325°F. Butter 2 8-inch square pans. Line the bottom and sides of the baking pans with parchment paper with the parchment overhanging opposite sides a bit. Lightly grease the parchment paper. In a medium saucepan, melt the butter and chocolate over low heat, stirring until full melted. Remove pan from the heat. Add the sugar and stir well. Add the eggs, vanilla, and espresso powder, whisk until blended. Whisk in the salt and flour until batter is smooth. Divide the batter between the two prepared pans and spread it evenly. Give the pans a few quick bangs on the counter to release any air bubbles. Place pans in oven and bake until a toothpick comes out clean. This will take about 25-30 minutes. Remove from oven and let cool completely on a wire rack. Once cool, remove the brownies from pan and chill on wire rack in the freezer for 10-15 minutes. Line the bottom and sides of an 8-inch square pan with plastic wrap. Next, line the bottom (again) and the sides that aren't covered with another piece of plastic wrap. You are essentially making a plastic wrap sling. This will make it easier to wrap up the brownie and ice cream. Place one of the cooled 8-in brownies, top side facing down, in the bottom of the plastic wrap lined pan. Working quickly, cover with ice cream. Use a spatula to smoosh down the ice cream and smooth it out on top. Place the second 8-inch brownie top side up on the ice cream and press down a little (not too much or the ice cream will squish out). Leaving the giant ice cream sandwich in the pan, wrap the ice cream sandwich up with the plastic wrap sling and place in freezer to freeze until firm, about 4 hours or overnight. I have two favorite brownies and these are one of them. I have yet to do a side by side taste test to determine if there is a clear winner. I make these most often because they are so quick to make. I'd probably say that my two favorite foods are pizza and hamburgers. (I kind of feel like a little kid when I say that. Haha!) If I'm going out for pizza, my favorite place is Pizzeria 712. Todd and I usually share the sausage pizza with roasted peppers, but right now they have a corn pizza with leek soubise, bacon, and ricotta that is definitely one of my seasonal favorites. I also love their speck pizza and I always order a side of arugula to pile on top. For a burger, hands down, Habit Grill. It's cheap and it's the burger I always crave. An added bonus is that Habit fries are always hot (the sweet potato ones are my favorite). When you have the choice between ketchup or fry sauce for your fries, which one would you choose? I like ketchup for regular fries and fry sauce for sweet potato. Picky, picky. In large mixing bowl, combine the flour, salt, and yeast. Add the water. Using a rubber spatula or wooden spoon, mix until the liquid is absorbed and the ingredients form a sticky ball. If the dough seems dry, add water a teaspoon or two at a time (you want it to be sticky). Cover the bowl with a damp tea towel and set aside in a warm spot to rise for 1 1/2 hours, or until the dough has nearly doubled in size. Once the dough has risen, using two forks, deflate the dough by releasing it from the sides of the bowl and pulling it toward the center. Rotate the bowl quarter turns as you deflate, turning the dough into a round ball. Once the dough has risen, using two forks divide the dough into 3 equal portions. Spread flour on a clean surface. Using the forks lift (or just kind of scoop out) each portion of dough onto the floured surface. With floured hands, shape each dough portion into a ball, using the pinkie-edges of your hands to pinch the dough underneath the ball. Let the dough balls rest for at least 20 minutes without touching. Place a baking stone on a 4-burner gas grill right in the middle. Turn the grill on and heat on high (all burners) for 20 minutes with the lid closed. Once the grill has preheated for 20 minutes, turn the two middle burners to low. Spread each pizza with a thin layer of sauce, calabrese, fresh mozzarella, pickled jalapenos, a drizzle of extra-virgin olive oil and a sprinkle of flaky salt (if you want). Slide the parchment paper with the pizza onto the grill. The parchment paper makes it easy to get the pizza on and off the baking stone. Bake until the cheese is melted and the crust is golden brown on the bottom. Ok, here's my trick (It's actually not really a trick, but I think it makes the pizza extra delicious by giving the air bubbles on the crust and the cheese some good char marks). Before you start cooking your pizza, preheat your broiler. Once the pizza is nearly finished on the grill (it's ok if the cheese hasn't reached it's full melty goodness potential, the broiler will take care of that) pull it back onto the upside down baking sheet and slide the parchment paper out from underneath the pizza (you don't want it to catch on fire under the broiler....not good). Place pizza under the broiler and cook until the cheese is bubbly and the crust has some char marks. Remove from oven and sprinkle pizza liberally with grated parmesan and a drizzle of honey over the entire pizza. Slice and Serve. I know this may seem a bit lengthy, but I promise once you do it a couple times, you'll be a pizza grilling pro. You'll learn how your grill heats and whether or not you need to adjust the grill temperature. Have fun with the toppings and remember that more toppings isn't necessarily better. Go for simple! Oh and here's the recipe for my favorite tomato sauce. It takes just a few minutes to throw together and always makes more than I need so I freeze the extra in 1/2 cup portions in baggies. This is awesome because it makes pizza night even easier. Mix the crushed tomatoes, garlic, and olive oil together. Add salt until the sauce goes from tasting blah to good (or as good as cold tomato sauce can taste...haha). The summer before 6th grade, I moved into a new house. I pretty much thought my parents were the worst for making me move and change schools. To make matters worse, they were making move away from my best friend. The best friend that I went with to the mall and classic skating. The best friend that did the science fair with me every year and who was my siamese twin for Halloween. The best friend who wore the other half of the best friend heart that dangled on a chain around my neck. My parents, like any parents would, told me that I'd make new friends, but I wasn't convinced. That same summer, before our big move, I went to 5th grade camp with the elementary school I had been attending and a few other schools. A day into the camp, my best friend went home with a bad case of "homesickness". I remember going back to my tent feeling sad and alone. Little did I know that Heavenly Father was watching out for me and that soon I'd be introduced to a group of girls that would become my very best friends. I remember standing in field with a big group of kids and a girl wondered over to me with a small group of girls standing a few feet behind her. She asked me if I was the new girl moving into the purple house (yes, our new house was a purple-grey color) and then told me they'd bring me cookies when I moved in. I'm not sure how out of all those kids, they knew it was me who was moving into their neighborhood, but I remember afterward feeling not so alone. Those girls did bring me cookies when I moved in and they became my very best friends.... really the best friends anyone could ask for. We've been through a lot together...A LOT (pretty much everything imaginable) and to this day I love them with all of my heart. A few weeks ago, one of these best friends was visiting from Florida (the one that told me they'd bring me cookies). As soon as I found out she was coming, a group text was sent out to all our Utah friends to plan on a girl's brunch at my house while she was here. We sat around my kitchen table for 4 hours eating, talking, laughing, crying, and eating and laughing some more. The time apart from each other may be months and in some cases years, but when we get together it's like we were never apart. After everyone left, I sat in my kitchen with piles of dirty dishes, platters with crumbs of chocolate chip scone loaf and brown butter blueberry muffins, and a heart filled with so much love and gratitude for these amazing women in my life. Preheat the oven to 400°F. 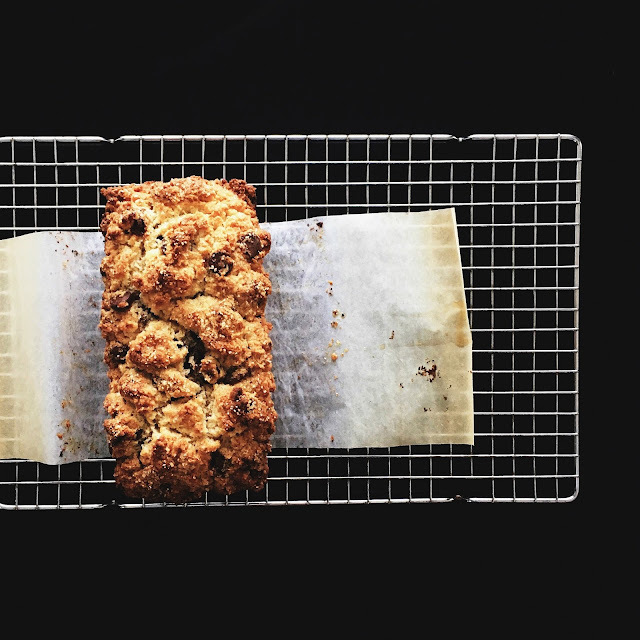 Line a 8 x 4-inch loaf pan with parchment paper, allowing the parchment to hang over the edges on the long sides of the pan. In a food processor, combine the flour, baking powder, salt, and sugar and pulse to combine. Add the butter cubes and pulse until the butter is the size of peas. Add this to the bowl with the marzipan and chocolate chips. In a small bowl, whisk together the eggs, cream, and extracts and add to dry ingredients. Using a spatula or wooden spoon, stir until just combined. Pour the mixture into the prepared loaf and spread it out evenly. Sprinkle top with 2 teaspoons sugar (I used raw sugar) and bake for 40 minutes or until golden brown on top and a toothpick inserted into the center comes out clean. Cool in pan on a wire rack for 20 minutes. Using the overhanging parchment, remove scone loaf to the rack to cool completely. Slice with a serrated knife and serve with ricotta and honey. I've made this without the marzipan and it was still incredibly delicious!